Aerial view of Kentucky Lake and Lake Barkley. Lake Barkley is on the right. The canal connecting Lake Barkley to Kentucky Lake is visible at left-center. Lake Barkley, a 58,000-acre (230 km2) reservoir in Livingston County, Lyon County and Trigg County in Kentucky and extending into Stewart County and Houston County in Tennessee, was impounded by the U.S. Army Corps of Engineers in 1966 upon the completion of Barkley Dam. Both the lake and the dam are named for Vice President Alben Barkley, a Kentucky native. The dam impounds the Cumberland River near Grand Rivers, Kentucky, approximately 38 miles (61 km) upstream from where the Cumberland empties into the Ohio River. One mile (1.6 km) above the dam is a canal connecting Lake Barkley with Kentucky Lake, forming one of the greatest freshwater recreational complexes in the country. The lakes run parallel courses for more than 50 miles (80 km), with the Land Between The Lakes National Recreation Area located between them. 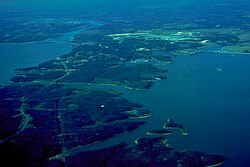 Lake Barkley is 134 miles (216 km) long with a shoreline measuring 1,004 miles (1,616 km). The lake's level is maintained at different levels throughout the year for flood control purposes. Summer pool, 359 ft (109 m) above sea level, is normally reached by May 1. The water level begins dropping gradually on July 1, and winter pool (354 ft/107 m) is reached by December 1. The spring rise starts April 1. The lake's water surface area varies accordingly from 57,920 acres (234 km²) at summer pool to 45,210 acres (183 km²) at winter pool. As with the formation of Kentucky Lake, communities were flooded in the 1960s to build Lake Barkley. Locals often refer to "Old Eddyville" for Eddyville and "Old Kuttawa" for Kuttawa. The "Old" areas were the portions of the cities that were left above the water after the areas were flooded; these old areas are now lakefront. The present-day cities were created on nearby sites after the lake was impounded. Old foundations and streets, previously flooded, are still visible during winter pool. Highways were even relocated, including US 68 and US 62, along with state routes and smaller streets. The Illinois Central Railroad was also relocated; the former alignment can still be seen under water from low flying planes above. Lake Barkley State Resort Park is located on the eastern shore of the lake. The largest yellow bass ever taken in Kentucky (1 lb., 1 oz.) was caught in the waters of Lake Barkley. Wikimedia Commons has media related to Lake Barkley.